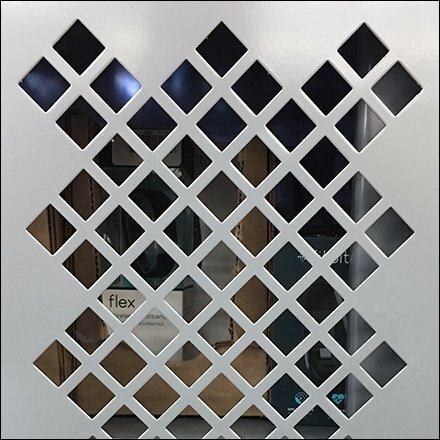 An oversize Online Order Pick Up Perforated Security Cabinet provides the protection. Extra front facing space billboards the customer-convenience benefit: “Order Online, Pick Up In A Store.” The benefit in small print is “Fast, easy, and no shipping charges.” If you can’t wait even a day for overnight delivery, browse the entire selection online, then pick up yourself. The balance of the Security Cabinet provides some visual access via Damond Pattern Perforation. I suspect the unit locks to prevent a reserved item waiting for its new owner from being sold to someone just passing through. Imagine customer dissatisfaction if you drove to the store, and they had not reserved your item. Consider this Online Order Pick Up Perforated Security Cabinet in the gallery of images.